Evesham M-Box is a wireless networked hard disk storage device that comes with a Roku wireless streamer and Roku Soundbridge. Evesham allows user to move and store all the multimedia files from the PC, and stream the audio across to any part in your home by plugging in Roku MBridge adapter into any Hi-Fi or powered speaker system. 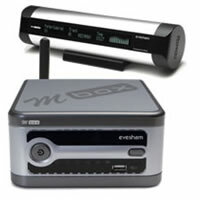 Evesham MBox features Wi-Fi connection and 2 mirrored hard disks, wireless remote and displays song, album, artist, genre and composer information, and compatible with Internet radio. ComputerAct!ve reviews M-Box Media Server and M-Bridge WiFi Network Music Player and concludes with overall rating of 3 out of possible 5 that the M-Box unit is also a little noisy, thanks to its fan-based cooling system, and it’s not particularly handsome, either. If you can overlook these issues and aren’t put off by the relatively high price tag, the M-Box is actually an extremely useful dual-purpose device. The good points are useful dual backup/media, streaming functions, built-in wireless networking, mirrored disks for good backup. While bad points are won’t play DRM protected music files, expensive and noisy and no video or photo streaming.